Attempts to identify the major components of quality of life are not new. It is a continuously evolving field. The questions that are posed are what gives human lives a sense of satisfaction, fulfilment, and even happiness? What takes away from us feeling our lives have quality? In health care, physical and mental illnesses and disabilities are prime events to alter quality of life, but how and to what degree is a person affected are the questions asked by researchers in this field. In the case of heart failure stages A through D, there are opportunities to intervene to improve the quality of life for patients. This section includes a brief overview of the psychology movements that attempted to describe what constitutes quality of life, how they apply to patients at risk for heart failure and those who have heart failure, and the tools used to measure quality of life. Most of the measurements for quality of life in health care for cardiovascular patients have been developed for patients experiencing heart failure, stages C & D. Recently the Center for Positive Psychology has been researching not only quality of life components for patients with HF, but also using the tenets of PP that help prevent the development of HF described in Stages A and B. The humanistic psychology movement, which started in the 1960s, challenged the then somewhat deterministic vision of people presented by the psychoanalyst and behaviorists. Abraham Maslow introduced to us insights about human needs. We were shown that humans have needs that occur in a hierarchy with basic needs needing to be secured before we can move up the ladder to acquisition of higher needs. Shown here are the original human needs as described by Maslow (Maslow, 1954). Three additional levels have been added that include cognitive, aesthetic (self-actualizing) and transcendence needs on the top layers following self-esteem needs. Carl Rogers (1961, 1967), another humanistic psychologist, was in general agreement with Maslow’s assumptions. He described the need people have for an emotional environment that is real or genuine, offers acceptance (being seen with unconditional positive regard), and empathy (listened to and understood). 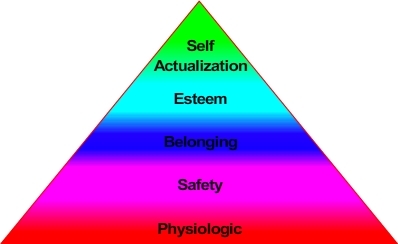 These were all important for the attainment of self-actualization Maslow describes to occur. Important for those of us in health care are Roger’s descriptions of self-image. His belief is people with high self-worth, positively regarded by others, treated with affection, and valued, have confidence and face the challenges of life successfully. He describes our tendency to have an ideal self-image that we attempt to closely match our actual self-image. Incongruence occurs when our vision of ourselves is different from what is occurring because of our choices or external events. If our ideal image is to be physically strong and we no longer can walk up a flight of stairs, our self-image is tarnished. He also advocated for client focused therapy which reinforced a person’s self-image by enabling them to be self-directed. Other humanistic theorists and researchers have followed. 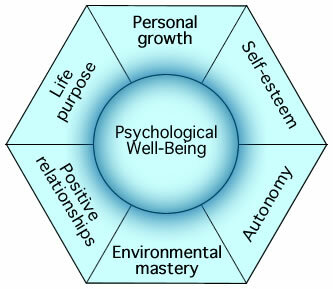 Carol Ryff, has described well-being as consisting of six components: self-acceptance (positive evaluation of oneself and one's life), personal growth, purpose in life, positive relations with others, environmental mastery (the capacity to effectively manage one's life and the surrounding environment) and autonomy (Ryff. 1995). "Positive psychology is the scientific study about what goes right in life, from birth to death, and all stops in between. What is good about life is as genuine as what is bad and deserves equal attention by psychologist (Peterson, 2006, p. 4)." Positive psychology integrates strengths, values and hopes with symptoms, weaknesses, and regrets. The therapeutic approach when using positive psychology is to not deny weaknesses or symptoms, but to amplify positive resources in patients like positive emotions, character strengths, meaning, positive relationships, and internally motivated achievements. More recently, Dr. Howard Seligman from the University of Pennsylvania further established the field of Positive Psychology. This scientific field of study is based on the belief people want to lead meaningful and fulfilling lives as well as a desire to be the best they can be. He and his colleagues have identified five components of happiness and well-being: positive emotion, engagement, relationships, meaning, and accomplishment (Seligman, 2011). A number of researchers have found, while this list is not all-inclusive, realization of these components are related to lower rates of depression and higher life satisfaction (Bertisch et al., 2014). Positive Psychology focuses only on the strengths, values and hopes of clients.